Cinderella, Snow White, Sleeping Beauty, Belle, Jasmine and Ariel are smiling down on each soon-to-be princess as participants enjoy enchanting fun and imaginative play! Perfect for your little Princess! 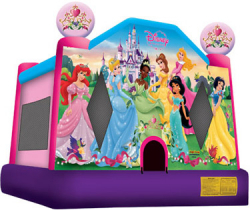 Large 15' x 15' bouncer.